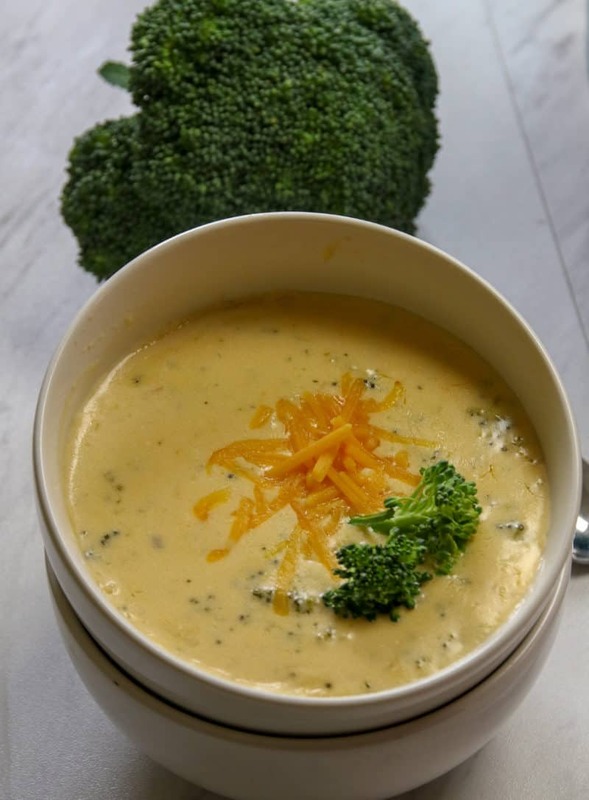 This is the BEST Keto Broccoli Cheese Soup recipe I’ve ever tried! 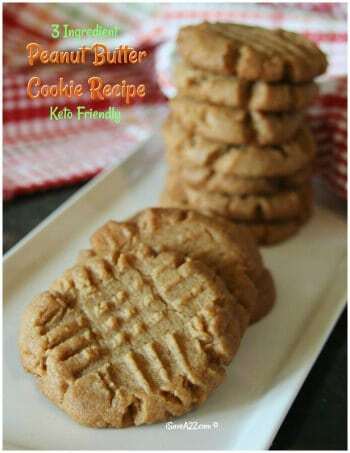 There is a small difference in this recipe that makes a world of difference in the taste. Once you make it this way, you will never make it any other way. Promise! The secret to this recipe is a small amount of hot sauce and a bit of garlic. Grandma taught me long ago that any time you make a cheese dish of any kind, you always add a small amount of hot sauce. 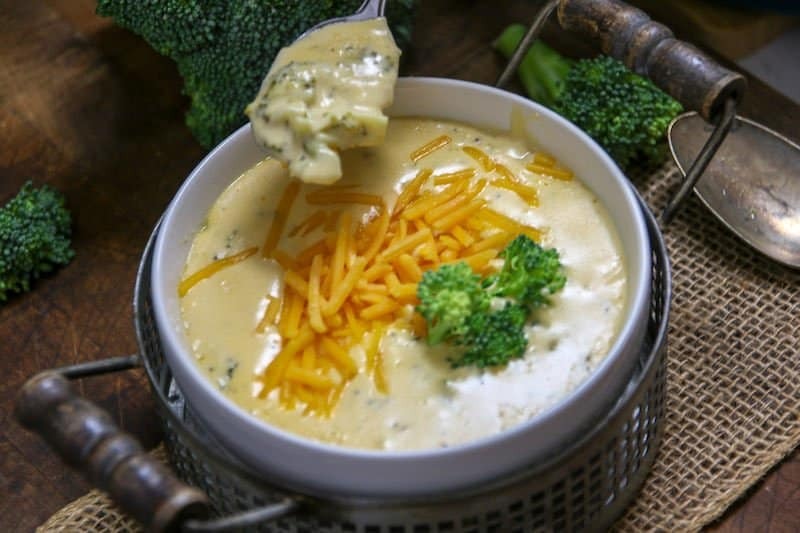 It compliments the flavor of the creamy rich cheese! Grandma did this with her cheesy mac & cheese bake recipes too! Now, I need to tell you that it’s not spicy at all. 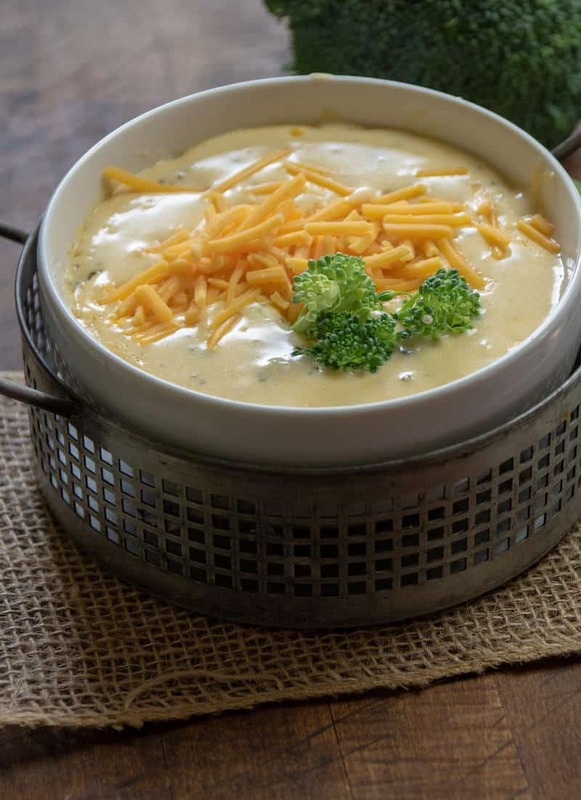 You won’t really notice the hot sauce itself but you will notice the creamy intense cheese flavors this soup has. Gosh, it’s good! OH! And… the cream cheese in this recipe adds a level of creaminess that will blow your socks off! I make this recipe often, so I included recipe instructions for the stovetop, Instant Pot, and the Crockpot too! 1. Place on a medium high heat, Melt butter, Add garlic and onions, saute until onions are translucent and soft. 2. Pour in chicken broth and heavy cream. 3. 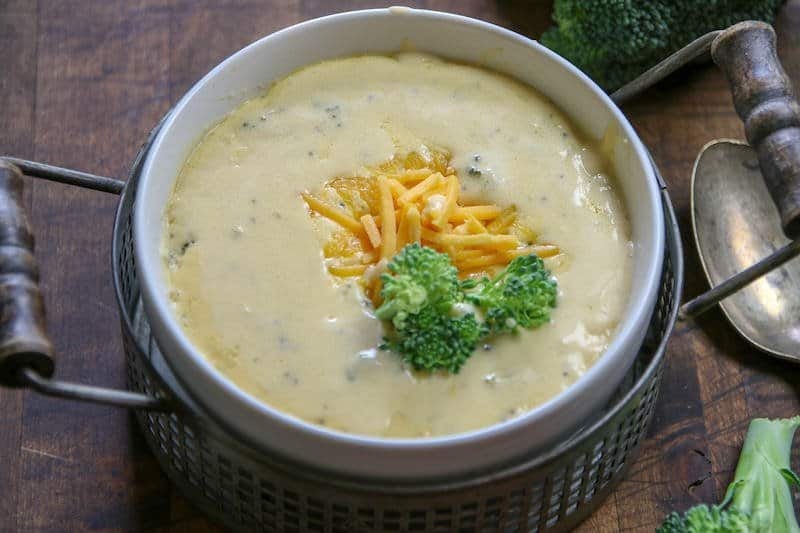 Stir in broccoli florets. 4. Cover and Continue cooking on a medium high heat for 15 minutes. 5. Remove cover and stir in cheese. 6. Continue cooking for 1-2 minutes until all cheese is melted. 7. Stir in 1 tbs hot sauce after cheese melts. 1. Press the saute button and melt butter, add garlic and onions, saute until onions are translucent and soft. 2. Pour in chicken broth and broccoli florets. 3. Place the cover on the Instant Pot and press the soup button with a setting of 5 minutes. 4. Quick release the pressure. 5. Add the cheese, cream cheese, hot sauce, and heavy cream. 6. Continue stirring the ingredients for about 1-2 minutes until all cheese is melted. 7. Set it aside for about 5 minutes to give it time to thicken. 1. Add the butter, garlic, onions, chicken broth, cream cheese, and broccoli florets to the slow cooker. 2. Set the slow cooker to a low setting for 3 hours. 3. After the ingredients have cooked for 3 hours, stir the soup mixture. 4. Change the temperature setting to warm and stir in the heavy cream, cheddar cheese, hot sauce. 5. Continue stirring the ingredients for about 3 to 4 minutes until all cheese is melted. Recipe Tip: Use a hand immersion blender if you prefer your soup a bit more smooth. Place on a medium high heat, Melt butter, Add garlic and onions, saute until onions are translucent and soft. Pour in chicken broth and heavy cream. Cover and Continue cooking on a medium high heat for 15 minutes. Remove cover and stir in cheese. Continue cooking for 1-2 minutes until all cheese is melted. Stir in 1 tbs hot sauce after cheese melts. Press the saute button and melt butter, add garlic and onions, saute until onions are translucent and soft. Pour in chicken broth and broccoli florets. Place the cover on the Instant Pot and press the soup button with a setting of 5 minutes. Add the cheese, cream cheese, hot sauce, and heavy cream. Continue stirring the ingredients for about 1-2 minutes until all cheese is melted. Set it aside for about 5 minutes to give it time to thicken. Add the butter, garlic, onions, chicken broth, cream cheese, and broccoli florets to the slow cooker. Set the slow cooker to a low setting for 3 hours. After the ingredients have cooked for 3 hours, stir the soup mixture. 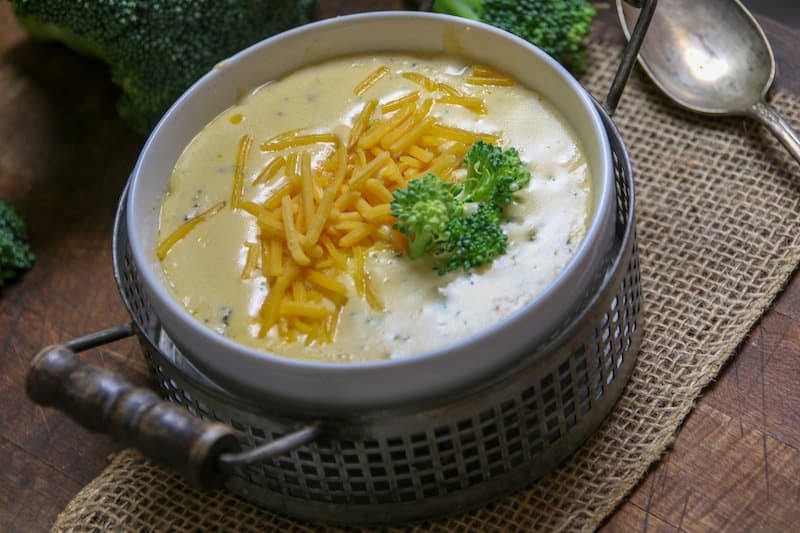 Change the temperature setting to warm and stir in the heavy cream, cheddar cheese, hot sauce. Continue stirring the ingredients for about 3 to 4 minutes until all cheese is melted. 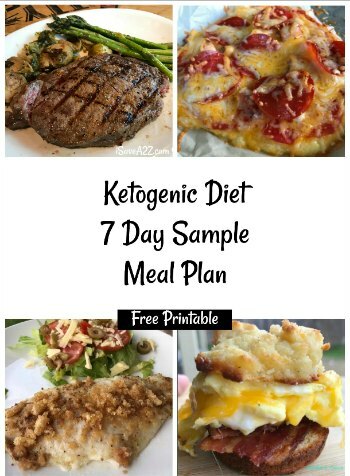 By Jennifer on September 29, 2018 Keto Dinner Recipes, Keto Friendly Recipes, Keto Lunch Recipes, Low Carb Recipes, Main Dishes, Ninja Slow Cooker Recipes, Recipes. Delish, even my 2 1/2-year-old grandson loved it. 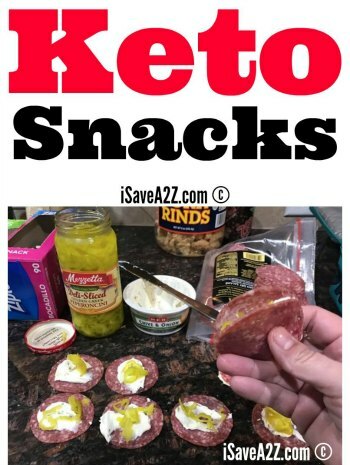 Very easy and quick to make. I used frozen broccoli and just cooked on the stovetop. I forgot the hot sauce. And I used my hand blender to smooth it out. This is a super quick soup to make. So much flavor! Rich broth and cheesy goodness. Perfect for these cold winter nights. Can this be made a day ahead? I would like to take this to a carry-in at work. I made this soup today with the help of my kids. It is delicious!!!! Not difficult to make at all. Thanks for sharing. I assume “hot sauce” means any old hot chilli sauce? I liked this recipe but it just wouldn’t thicken. Followed the recipe correctly but way to runny. Maybe less chicken broth and more cream so it can thicken. When do I add the cream cheese if making on the stove top? The very best soup I have had! We loved it. I added 1 tsp of black pepper and 1/2 tsp of salt. Go for it. I made this only added a teaspoon of Montreal’s Seasoning It was delicious!!! For stove pot cooking do we add cream cheese at same time as the cheddar? Just made this tonight and it was delicious! I messed up the recipe and it was still good, can’t imagine how much better it will be when I don’t screw up the instructions! Thanks for a great recipe! Omg this sounds incredible! Thank you for all of your hard work explaining the recipes in varying cooking fashions/appliances. 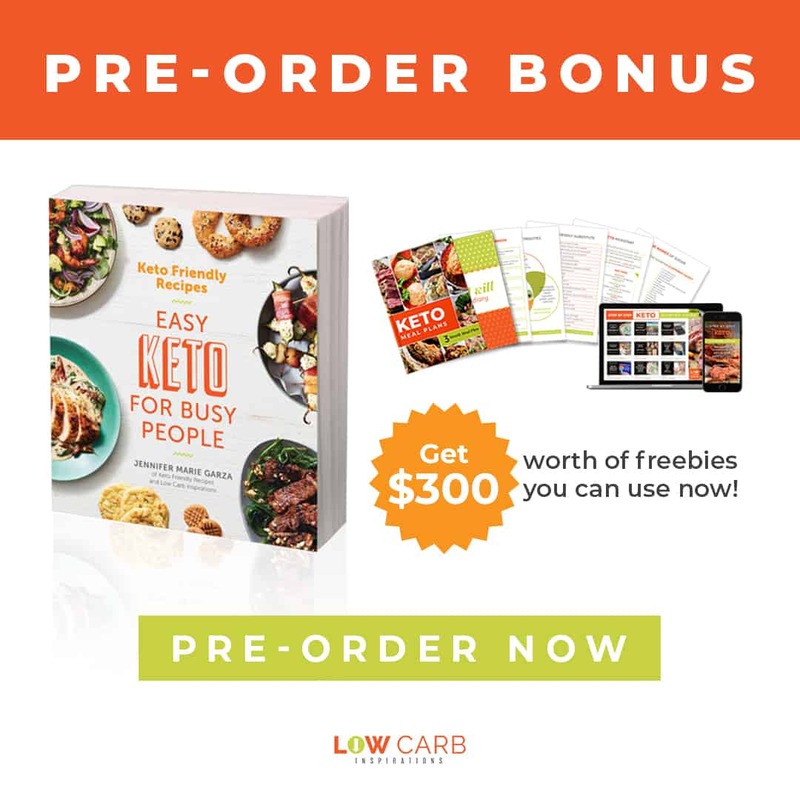 I have often thought “what a sweet soul this lady is for doing this for all of us” that I thought it time to share those thoughts with you 🙂 you have so many great recipes it is crazy! THANK YOU! Can’t wait to try this!